"Welcome to Fresh from the oven. A bread baking community where we bake one loaf at a time. Challenges are announced on the group's private blog on the first of each month and then on the 28th of the month each member posts their bread on their blog." 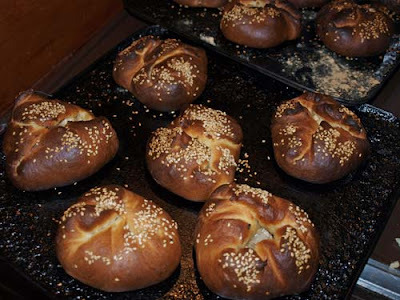 For September, Ria of Ria's Collection challenged us to make 'Stuffed Buns' using a sweet bread dough and filling it with a mixture of chicken and spices. 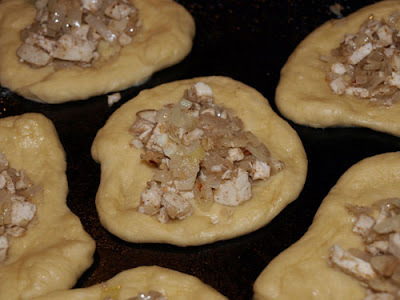 Here are the circles of dough with the filling in them ready to be pinched up into a bun. My oven is quite hot and although I thought I had compensated enough, they were very burnt. The photo shows the tray of the buns that were edible, the other two that were on a higher shelf were totally inedible. Nothing daunted, I decided to have another go and reduce the oven temperature to 160C and the time to 6 minutes. I also filled the buns with a mixture of onion, sweet potato and green pepper along with the ginger and garlic that was in the original chicken mixture, I think I preferred it to the chicken. Dissolve the yeast in warm water with 1/2tbsp sugar and 1/2 tbsp of all purpose flour. Leave aside for 10 minutes. Boil the milk and allow to cool down till it is warm to touch. Add sugar, oil and salt. Mix well with a wooden spoon till the sugar dissolves and add 1 cup flour and mix to a smooth paste. Add the beaten egg, yeast and mix.Add the remaining flour and mix well till it forms a smooth dough. Let it rest till it doubles in volume. Punch down the dough lightly using your palm and divide them equally. Flatten them into small discs and fill them with 1 tbsp of the filling. 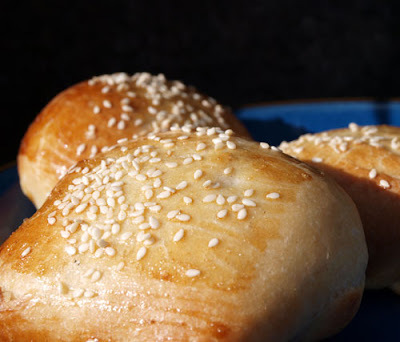 Re-shape them into a ball.Sprinkle the top with sesame seeds. Let it prove for another 20 mins. Bake them in a pre-heated oven at 200 degrees for 10 mins. When it starts to brown, give them an egg wash using 1 slightly beaten egg white. Heat oil, add the ginger garlic paste and saute till it gives out a nice aroma. Add the onions. Saute them till soft and transparent. Reduce the heat and add the powders and mix well for 2 mins. Add the shredded chicken and mix well. Keep it off the fire and let it cool. Use it for filling the dough. I really like the sound of the sweet potato filling! I have a fan oven which cooks (and singes) very quickly, I baked mine at about 175o for roughly 10 minutes, whilst sitting on the kitchen floor watching them like hawk! You really have to look after these little fellas. Shame about the first lot. The Second batch look great. Those look absolutely delicious! Thanks for sharing the recipe, I will have to try them soon. Wow - you must have a killer oven to do that in 10 minutes! I cleaned the window on the door of my oven last week and now I can actually see when I am burning things as opposed to just being able to smell it! 2nd batch look good. Mmm, love the sound of your veggie alternative and these look yummy! Maybe you slipped on the conversion from F to C on the first batch (assuming it was an American recipe). What a great challenge! I love the idea of a bun with spicy chicken. the spicy chicken filling looks wonderful. Thanks for the recipe. I love the sound of the sweet potato filling. Thanks for taking part in the September Challenge. 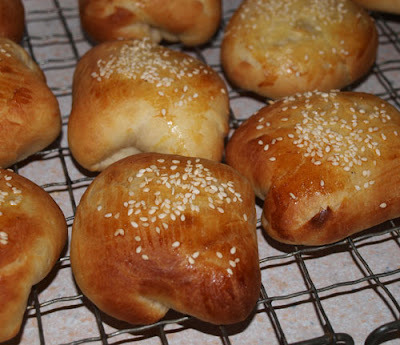 I have never heard of stuffed buns before but they certainly sound and look wonderful. Your photos look great! I love that everyone has done their own little modifications to the recipe. Will need to give the sweet potato filling a try I think. Welcome to the group. I love sweet potatoes so your filling sounds very nice. Glad you weren't put off by the first batch. These stuffed buns look teriific!! Wonderful even!! They must taste fab!